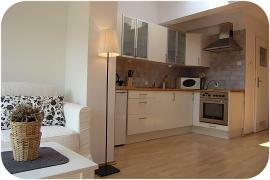 Bright 2 level Studio Apartment in the heart of the Old Town of Krakow, just 5 minutes on foot from the Main Square. It consists of a spacious room, fully equipped kitchenette and a bathroom with shower cabine and underfloor heating. There is a comfortable queen size bed in a spacious bedroom on the mezzanine and pull out double sofa. The location is really great! The flat is situated in tenement house, just few minutes walking from the Main Square.